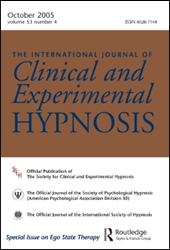 For over 50 years, the International Journal of Clinical and Experimental Hypnosis (IJCEH) has been the leading voice in hypnosis for researchers, scholars, and clinicians in psychiatry, psychology, social work, dentistry , and medical specialties. In fact, the IJCEH has been consistently ranked as one of the most influential publications in these respective fields, according to citation impact statistics (Source: SSCI Journal Citation Report). Whether you are involved in clinical work, counseling, research, or teaching, the IJCEH is your single essential resource to stay informed on the latest developments in hypnosis. The Institute of Scientific Information Journal Citations Report for 2005 ranks the International Journal of Clinical and Experimental Hypnosis 29th out of 83 journals in Clinical Psychology (social science) and 35th out of 77 journals in Psychiatry (social science), with an Impact Factor of 1.551. All research articles in this journal have undergone rigorous peer review, based on initial editor screening and refereeing by independent referees.